most famous artists of all time. His use of color to capture light and his "en plein air" technique combined to create an unmatched legacy in Impressionism. 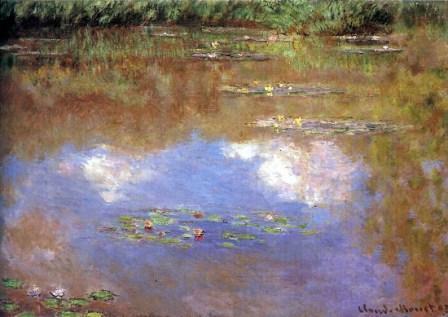 Monet believed that he painted only what he saw in nature. He painted the passage of time in a landscape. The light and movement created an effect that made his paintings look somewhat blurred, but still distinguishable. Monet worked tirelessly on his paintings and his technique. Often unsatisfied with his work, he would reuse canvases painting over entire works of art that many would have considered masterpieces. He would paint on a schedule for hours a day and plan all events around the time he had blocked out for painting. When traveling he would paint more still, inspired by the landscape, instead of spending all of his time on leisure and tourist activities. Many of his paintings were created on ambitiously sized canvases. The Grandes Décorations in the Musée de l'Orangerie are on giant panels 6 feet 7 inches x 55 feet 9 inches (2 meters x 17 meters) that cover the walls in two elliptical rooms. Monet used oil paints to render his fantastic works of art. Oils are slow-drying. Using this property, the painter can mix colors, blend, and so on while the paints are in varying degree of dryness. Oil paints are usually dry to the touch in a few days to two weeks, but they aren't considered completely dry for a year or so. Oils are incredibly diverse, they can be applied thickly or thinly and can cover the layers underneath or be transparent. Read more about Monet's Impression, Sunrise considered the first Impressionist artwork.